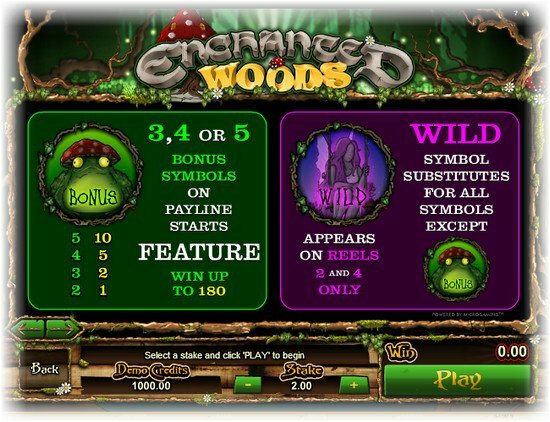 Enchanted Woods has a lot of things that are special about it, starting with the gorgeous design which takes you into the depth of an enchanted forest, and continuing with the layout, the way it gives you prizes, the type of wagers you place and even the Hold option, which is very important to the way the game plays. Overall, I feel like it’s one of those great games that tries to change as much as possible about what you expect from slot machines. The designer responsible for this slot is Microgaming. 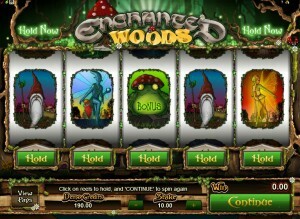 While Enchanted Woods has the usual 5 reels, the game has only 1 bet line, which makes it quite weird. The game awards up to $7,000 in prizes and it has a Hold option, wilds and bonus games. The game does away with the usual system of playing modern slots, and while it uses 5 reels it only has one symbol on each one. You can form combinations of sorts on these lines, but in truth pretty much all the symbols are scatters, so it doesn’t matter where they land on the only payline available. Your only goal here is to create a winning combination, and you use the Hold option to your advantage. You get two spins of the reels for each wager you place. First, you start off with the initial spin, where you get five symbols. Next, you get to use the Hold buttons, which are placed underneath all the reels. It doesn’t cost you anything to use them. You choose the symbols which you want to keep for the next spin, which is free. You should keep matching symbols and/or bonus icons. You also should always keep the wilds. You click Continue, and you get the second spin for free, with the held symbols remaining in place, while the other reels spin. You can even keep all five symbols if you’re satisfied with what you’re getting. You need at least three scattered symbols to get a prize. 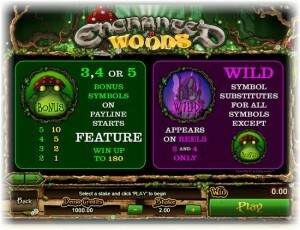 One symbol that can help you would be the wild of Enchanted Woods. Using a purple symbol with a fairy in it, this wild is reserved for the 2nd and 4th reels. It can substitute for a regular symbol, so the only one that doesn’t take advantage is the Toad bonus. Now, there is a bonus game as well here, started with help from a Toad symbol, which thanks to the design actually seems to be a Toadstool as well. Once again, this is a scatter symbol, same as the regular ones, so you need three to five on the reels, but they don’t have to be aligned from left to right. You also receive a prize between 1x and 10x when 2 to 5 are present. 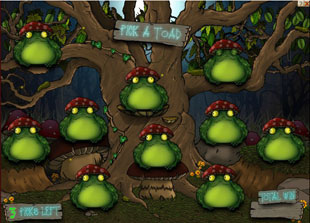 The next screen shows you an enchanted tree, with many toads sitting on its branches. You have a number of picks to make, each one awarding a different random prize. With only one payline offered, the game is very easy to play, since you only need one coin to trigger the spin. You decide how much the coin is worth, and the range is pretty big, between $0.10 and $100. The game gives you up to 70 times the line bet, which is also the total bet. Up to $7,000 cash can be won. It’s a gorgeous looking slot machine, and quite unusual to look at to be honest. It’s different mostly because you only get 1 payline on 5 reels, and each reel has only one symbol to show you. The enchanted forest is everywhere around the game area, with trees, branches, vines and leaves decorating the reels and each individual symbol. As for the symbols themselves, they look a bit like images from tarot cards, at least that’s the kind of drawing style that they went for. Symbols: Pink Fairy (wild), Toad (bonus), Night Fairy (70x), Yellow Fairy (60x), Green Fairy (50x), Leprechaun (30x), Gnome (15x), Blue Fairy (15x), Toadstool (10x) and Demon (10x). Yes, it’s definitely worth trying out. It will be a different experience than you’re used to, with all the symbols being scatters and with the Hold option making you actually consider what your next move should be. 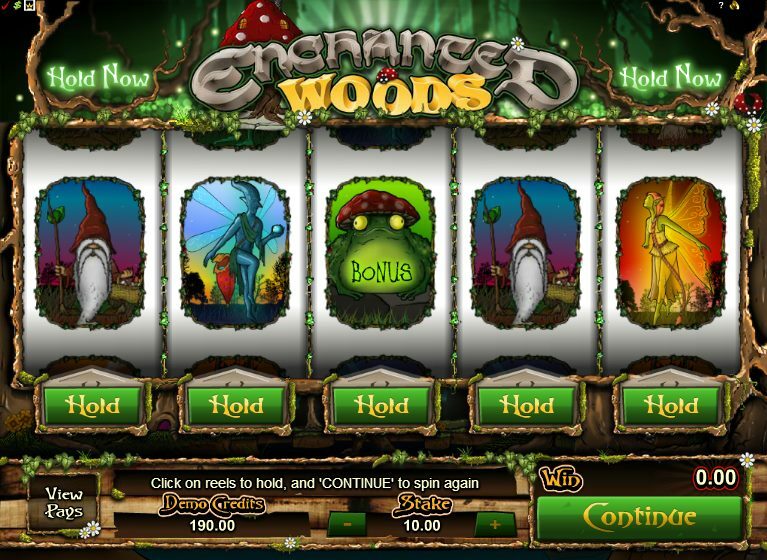 You will find Enchanted Woods at any online casino which chooses to use software from Microgaming, playable either for free or for real money.